When you read about the Armstrongs who arrived in America and specifically Falmouth, Maine you will see several references to John Armstrong and some of James Armstrong. You don't see hardly any references of John's brother, Simon Armstrong. In fact, there is not many of records of Simon at all. Which is too bad as he is my 5th great-grandfather. Simon Armstrong was born circa 1701 in Ulster, Ireland. His family was originally from Scotland. Simon Armstrong came to Falmouth, Maine with his father and siblings in the Winter of 1718. He married his wife Isabella very soon after he arrived in America. Based on the gaps in the dates of the birth of Simon and Isabella's children that it is likely we are missing several of their children. Simon was a corporal in Col Westbrook's regiment between Nov 22, 1724 and May 22, 1725. While fighting Native American's he suffered a wound to his head, but did survive. Simon received multiple land grants from the Town of Falmouth and Cape Elizabeth, Maine. In 1733, Simon Armstrong sold a portion of his land to Samuel Waldo. (York Deeds Book 16, Fol 161 pg 492-493. Sept 5, 1733. This land transaction identifies Simon's wife as Isabella Armstrong. My great grand Aunt, Marion Armstrong, stated that as a young girl she has seen one of the original land grants from 1747. She incorrectly remembered that it was a land grant to Samuel vs Simon. Unfortunately, those original land grants were lost in a fire. 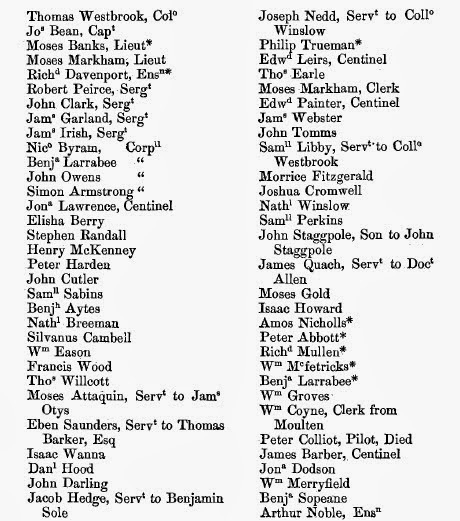 According to the list of parishioners of the Second Parish of Falmouth in Cape Elizabeth the only Armstrong listed in 1743 is Simon Armstrong. All of James Armstrong's other children had moved out of Cape Elizabeth by this time and Simon's children are too young to be parishioners. In a land transaction from March 7, 1772, John Armstrong (Simon's son) sold land to Nathaniel Dyer which was partial from land grants to Simon Armstrong and James Armstrong (John had purchased some of the land granted to James a few years before from another relative). This land transaction further indicates that this John Armstrong was Simon's son. In fact, John Armstrong and Andrew Simonton Jr owned several parcels of land jointly. Which would be unusual except for the fact that John and Andrew were brothers-in-law. I recently found this document which is Simon Armstrong providing an affidavit in 1770 where he testified to the fact that William Roberts had owned a piece of land which must have been in dispute. Here is a copy of that document. We don't know exactly when Simon Armstrong died, but I did see a reference to probate of his estate as follows...administration granted to John Armstrong, gentlemen of Cape Elizabeth, on the estate of his father, Simon Armstrong, yeoman. Dated July 18, 1778. One of the most fascinating lines of my family research have been the Armstrong's of Falmouth and Cape Elizabeth, Maine. The Armstrong's lived in County Londonderry, Ulster Ireland...likely close to or in Aghadowey. They were members of the Presbyterian congregation of Rev. James McGregor who lead the migration of approx. 300 Scotch-Irish families to America. The Armstrongs arrived in Falmouth, Maine (now Portland) in August 1718. The arrived on a ship named The Robert, which arrived from Ireland and included Scotch-Irish families fleeing persecution for their Presbyterian beliefs. I have posted extensively about their descendant John Armstrong and his family. The patriarch of the Maine Armstrong's is James Armstrong. He arrived with his children: John, Simon, Thomas and his daughter Jean/Jane (who married Robert Means). When researching the Armstrongs of Falmouth, you will find numerous references which provide conflicting information regarding who was the Patriarch of the Maine Armstrong clan. Was it James or John? I have seen references to both John and James patriarch. However, I believe the evidence supports that it was, in fact, James Armstrong as the elder and patriarch. In the compilation of records of the First Parish Church of Falmouth published in 1898 (Baptisms and Admissions from the Records of First Church of Falmouth, pg 147), it indicates that James Armstrong arrived in 1718 with his sons John, Simon and Thomas and his daughter the wife of Robert Means. In addition, I found the following land sale that is definitive proof that John Armstrong was the son of James Armstrong. We know that this John Armstrong is the John Armstrong sometime considered the John Armstrong Patriarch, since there are numerous references to him moving to Pepperlborough (now Saco, Maine). This land sale clearly indicates that John is the son of James Armstrong. Some of this confusion probably has occurred that John was very active in the local church and is mentioned in numerous historical accounts, much more so than his father, James. I recently uncovered a genealogy of the Armstrongs by Harry Alexander Davis which he compiled in the late 1800's. I tend to believe that early research done closer to the events that take place tend to provide more accurate data. Quite often they capture information from people that have first or second generation information that is more accurate. 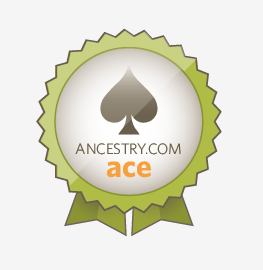 James and Jean Jameson Armstrong are my 6th great-grand parents. I think it is likely there were two James Armstrong's that arrived at Falmouth aboard The Robert. James Armstrong the Elder or father and James Armstrong his son. Mr Davis wrote that James Armstrong Jr. died in childhood. It is possible that this is true, but that they had another son that named James Armstrong that did survive (it was not unusual at that time to name children with the same name if a child died). I think it seems likely that the James that married Mary was actually James Jr. Does any information support this? Three main reasons: If James the elder married May, then he would be 50 years old when his son Thomas was born and 54 when James was born. It is certainly possible that he could father a child at those ages, but if we assume that Mary was approximately his age, she should be too old to bear him children. Now of course, it isn't impossible or even unlikely, that Mary could have been 10 years or more his junior, but even then it is late for her to be having three children. Another reason that seems fishy to me is that James has a son named John born around 1701. Why would he name another son John while his other son, John, was still living. I don't know of a Scotch-Irish tradition where you would have two sons with the same name living at the same time. This "two John's" is probably the most compelling reason that we are talking about two different James: Father and Son. The third reason is that there appears to be at least one mention of a living James Armstrong in the town records after he would have died. I will go into this a later in this post. In addition, an Elder Thomas Armstrong arrived with the Armstrong's to Falmouth. While he isn't mentioned in Mr. Davis' genealogy it is simple to assume that any reference to Thomas Armstrong must be referring to James' infant son. However, a Thomas Armstrong is awarded land in 1721 in Falmouth. It in unlikely the Selectmen of Falmouth would give land to a 4 year old. In all the information I have read about the Armstrong family of Falmouth, I seem to be the only one raising these questions. A James Armstrong was prominent in early Falmouth. Falmouth had been inhabited in the late 1600's, but had been abandoned after a number of Native American conflicts. At the time of James and his families arrival it was only starting to be re-inhabited. In 1720, James Armstrong was elected as a town selectman. In addition, 3/10/1720 he was granted a house lot and three acre lot. On 3/13/1720 James was granted a 30 acre lot. The English and French continues conflicts spilled over into the New World. The French incited the local Native American population of Maine to attack the small settlements of colonists. Then acting Massachusetts Govenor William Dummer declared war on July 25, 1722 on "the Eastern Indians, with their confederates, robbers, traitors and enemies of King George." The war lasted three years. To help defend their new home, James Armstrong and Simon Armstrong joined the command of Colonel Thomas Westbrook. James Armstrong achieved the rank of Lieutenant. Here is the Muster Roll of Colonel Westbrook's company from Nov 22, 1724 to May 22, 1725. Simon Armstrong was wounded during fighting with the Native Americans. In a letter from Col. Westbrook, he states "....one Simon Armstrong was scarred on his head, flesh wound, the Enimy (enemy) fought smartly where they stood." A James Armstrong was dead, but which James Armstrong? I tend to think of war as a young man's endeavor. Colonel Westbrook was only 48 years old when he commanded his company. If James Armstrong, the elder, was a Lt. under him, he would have been 57. Not too old to fight, but he would have been considered advanced in age for the time. Where James Armstrong Jr. would have been about 27. Evidence that supports that it is likely James Armstrong Jr who was the one killed is that land was granted to Mary Armstrong (widow) received a land grant in 1727. 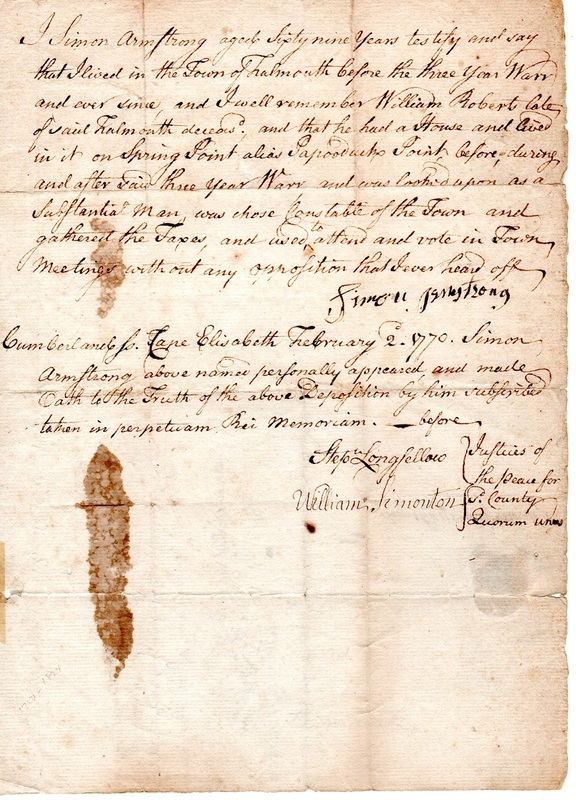 In addition, a Mary Armstrong (widow) married Hector Patten on 3/11/1735 and moved to Biddeford, Maine in 1738 and lived next door to Robert Means. Which would have been James' brother-in-law. I believe I am descended from James' son, Simon. He will be the subject of some future posts.